Toronto, Ontario: July 12, 2018. Conquest Resources Limited (TSX-V: “CQR”) reports that the final results and interpretative report for the high-resolution, airborne geophysical survey on its Golden Rose property have been received and analysed. “Based on the combined magnetic and electromagnetic data interpretation outcomes, at least 20 targets associated with magnetic and EM conductive anomalies favourable for gold exploration were identified and delineated within the Golden Rose Property. Among these targets, there are eight highly favourable targets that are prioritized for future follow up.” (Geotech Report, 2018). The helicopter-borne Versatile Time Domain Electromagnetic (VTEM™ Plus) and Aeromagnetic Geophysical Survey was carried out by GEOTECH Ltd., over the Golden Rose Mine project area in March 2018. During this survey, in total, 179-line kilometers of VTEM data and horizontal magnetic gradiometer geophysical measurements were collected over the Golden Rose Mine property, along transverse lines spaced at 100 m apart and tie lines spaced at 1,000 m apart, using an Aerospatiale A-Star 350 B3 helicopter, owned and operated by Geotech Aviation Ltd.
Data processing was performed by Geotech Ltd in Aurora, Ontario in April 2018. An interim processing report was delivered in May 2018 with the final report delivered to Conquest in June 2018 (Geotech Ltd, 2018). The primary objectives of the helicopter-borne geophysical survey and the interpretation of the acquired data were to derive detailed lithological and structural maps of the Golden Rose Mine project area and to delineate new favourable areas for detailed exploration of gold and/or other mineralization and related alteration zones (Figure 1). To provide a resistivity (conductivity) distribution of the near surface area. 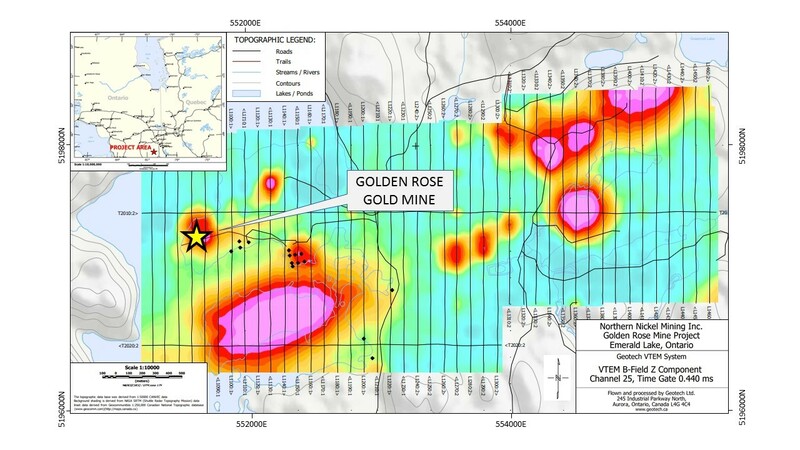 The data interpretation objectives were to derive a detailed structural map of the Golden Rose property, which highlights the structural control of mineralization and to delineate favourable target-areas for further exploration of gold mineralization, and related sulphides and alteration zones. To identify new favourable target-areas for further exploration of gold mineralization. To achieve these goals the interpretation efforts were based on magnetic and VTEM data transformations and inversion results and their integration with known mineralized occurrences and geological information. Airborne magnetic surveys have been used for a long time as a cost-effective tool for detailed geological mapping and mining exploration. Advances in magnetic data processing and the availability of robust inversion software designed to invert the data in 1D, 2D and 3D dimensions have helped advance magnetic prospecting techniques as an effective tool for lithological and structural mapping in general, and mineral exploration in particular. The use of standard and advanced filtering techniques utilizing Fast Fourier Transforms provides a good understanding of the structural framework of the study area, while 3D inversion yields a tri-dimensional distribution of the magnetic properties for the subsurface to help detect zones of interest including, fault-controlled mineralization, alteration zones, as well as magnetite-rich and magnetite-bearing mineralization. The main objectives from the magnetic data analysis and inversion results are to derive a detailed structural analysis of the property, a 3D distribution of the magnetic properties of the subsurface area, and to provide geometric and magnetic parameters of the magnetic sources such as mafic rocks, and magnetite-bearing and magnetite-rich structures that may either host or control gold mineralization. One of the primary goals during the structural interpretation of the magnetic data was to identify and delineate structures and faults that may control either gold mineralized and gold bearing magnetite-rich Banded Iron Formation (“BIF”) or mafic/ultramafic bodies. Moreover, magnetic data analysis focused on delineating alteration zones that may control, host, and surround the mineralization (e g., secondary hematite or magnetite alterations). The acquired magnetic data were transformed to provide detailed maps for comprehensive analysis, including 3D magnetic inversion to obtain 3-dimensional magnetic susceptibility and magnetization amplitude distribution of the subsurface area, as well as identification of magnetic structures associated with magnetite-rich BIF and mafic/ultramafic rocks suspected of either controlling or hosting gold and base metal mineralization. The VTEM data have been analyzed and inverted using various algorithms based on 1D EM inversion, 3DMVI inversion, 3D magnetic susceptibility inversion, and 2.5D Maxwell plate modelling which confirmed the presence of numerous shallow and deep-seated conductive zones presenting an interest for the exploration of gold mineralization and related sulphide and/or alteration zones. Potential gold mineralized zones highlighted from the inversion results are suggested to occur at shallow depths, all generally south-east dipping, and associated with highly magnetic features. The 3D magnetic interpretation and inversion results provided a detailed structural map of the property, which includes the outlines of the magnetic structures and the main faulting systems that crosscut the survey area. The mapped highly magnetic structures are suggested to present a link to BIF or mafic/ultramafic rocks (komatiites) that represent the main host/control of gold mineralization and related sulphides, and associated alteration zones. The combined analysis of the transformed maps and the 3D inversion outcomes resulted into a detailed structural map of the Golden Rose property area which includes combined results from magnetic and VTEM data inversions and their interpretation on which known gold mineralized zones and previously mapped lithological units are plotted for correlation purposes. The results suggest the presence of numerous highly magnetic features characterized by various lengths (100-1000m) and generally striking in the north-eastly direction. These features are interpreted to suggest a direct link to BIF, and possibly to mafic/ultramafic rocks. Moreover, the inversion results also suggest the presence of a broad magnetic zone measuring approximately 1.5 × 5 km in size, dominating the survey area, and stretching in the NE direction. This feature is suggested to be associated with a deep-seated magnetite-rich or hematite-rich alteration zone that surrounds the highly magnetic features. Based on the combined magnetic and electromagnetic data interpretation, at least twenty (20) targets associated with magnetic and EM conductive anomalies and favourable for gold exploration were identified and delineated within the Golden Rose Property. Among these targets eight (8) are regarded as highly favourable and are prioritized for additional mapping, geochemical, and diamond drilling follow-up. Based on the combined magnetic and VTEM inversion and interpretation results and their integration with known mineralized occurrences and available geological information, new insights into the structural context and gold mineralization prospectivity of the Golden Rose Mine property are suggested. Several targets for gold mineralization have been identified for further follow-up work within the Golden Rose Mine Property. The newly identified conductive targets occurring within favourable geological context (lithological and structural control) are considered as potential candidates for gold mineralization associated with magnetic structure (magnetite-rich BIF and or mafic/ultramafic rocks). Evaluate the potential advantages of carrying out detailed ground geophysical follow-up surveys within the selected gold target to better define the anomalies. The VTEM data helped map and detect numerous conductive and chargeable zones that may be linked to gold mineralization and/or related sulphides and alteration zones. At least twenty (20) conductors were identified and delineated, among which eight (8) targets that occurr in coincidence with strongly magnetized zones and represent prospective locations for gold-sulphide mineralization and are considered as the most favourable areas for mineral exploration. Paul Smith P. Geo. (NS) Vice President Exploration, directs the Company’s exploration programs and is the Company’s Qualified Person for the purposes of National Instrument 43-101 and has approved the technical disclosures within this News Release. Conquest Resources Limited incorporated in 1945 is a mineral exploration company that is engaged in the exploration of mineral properties in Ontario. 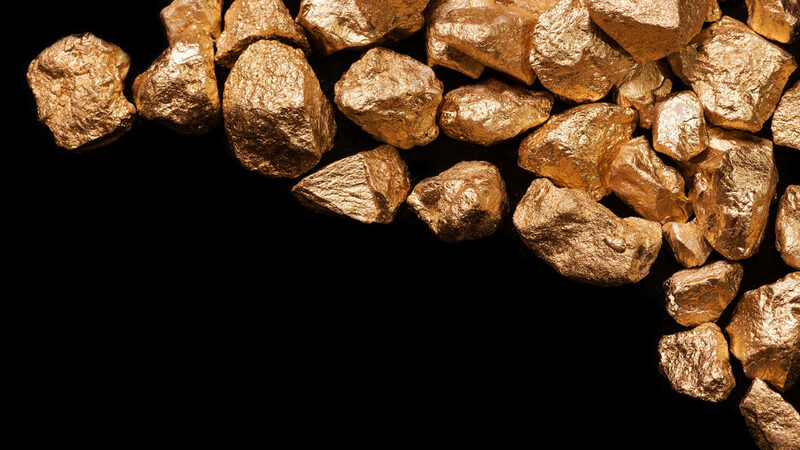 The Company’s principal exploration target is gold. Conquest holds a 100% interest in the Golden Rose Property located at Emerald Lake, sixty-five (65) kilometres northeast of Sudbury, Ontario. The thirty-three (33) easily accessible patented and staked mining claims encompass 770 hectares and the former Golden Rose Gold Mine, located deep within the regionally large, unexplained Emerald Lake (Temagami) Anomaly, which closely resembles the magnetic signature of the adjacent Sudbury Basin. Conquest’s exploration strategy at its Golden Rose property is to target gold mineralization lying along the two prospective horizons of Algoman-type Banded Iron Formation, which trend east-northeast across the entire strike length of the Golden Rose property. Conquest has now increased its land position in the area by approximately 3,200 hectares and currently holds a total of 3,980 hectares of prospective mineral exploration ground. Conquest also holds the Alexander Gold Property located immediately east of Goldcorp’s Red Lake and Campbell mines in the heart of the Red Lake Gold Camp on the important “Mine Trend” regional structure. Conquest’s property is almost entirely surrounded by Goldcorp’s land holdings. In addition, Conquest owns a 100% interest in the Smith Lake Gold Property which consists of patented and staked mining claims in Leeson, Stover, Brackin, and Rennie Townships in northern Ontario, lying to the north, west and south of the former Renabie gold mine. Click here to Download the full News Release (PDF). This news release may include certain "forward-looking statements". All statements other than statements of historical fact, included in this release, including, without limitation, statements regarding potential mineralization, resources and reserves, exploration results, and future plans and objectives of Conquest, are forward-looking statements that involve various risks and uncertainties. There can be no assurance that such statements will prove to be accurate and actual results and future events could differ materially from those anticipated in such statements. Important factors that could cause actual results to differ materially from Conquest’s expectations are exploration risks detailed herein and from time to time in the filings made by Conquest with securities regulators. Neither the TSX Venture Exchange nor its Regulation Services Provider (as that term is defined in the policies of the TSX Venture Exchange) accepts responsibility for the adequacy or the accuracy of this release.